In mink and in denim, in bleached blond bouffant and in shoulder-length shags, the fans of 37-year-old Elvis Presley flocked to Madison Square Garden last night to see the first live concert ever given in New York by the King of Rock ‘n’ Roll. In many ways the event was like a mother and child reunion. When Elvis the Pelvis, as he called in his heydey, gyrated, television cameras blipped him at the waist 16 years ago, and parents tried to stop their daughters from viewing the sensual roll of his hips. Now, 400-million records and a generation later, some of those fans of the 1950’s brought their own daughters to see the man their mothers had warned them against. “We had different values in those days,” explained Mrs. Eleanor Glick, who proudly accompanied her 16-years-old daughter, Toby. Last night’s performance was the first of four Mr. Presley is scheduled to give this weekend. 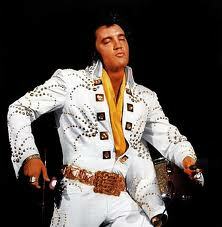 The audience that filed into the Garden seemed composed of equal parts of the old Elvis fans and the new. It seemed as if all the women at the concert had their own private reasons for coming. “I’m 29 years old and this has been my fantasy since I was 13. My psychiatrist said ‘Go, get it out of your system’,” Kathleen Crumish of Manhattan said without a hint of embarrassment. On stage in his white sequined jumpsuit, and cape, Mr. Presley did not disappoint his squealing admirers, one of whom leaped out of the loge onto the stage after he had tossed her his gold scarf. At a press conference earlier in the day, Mr Presley-lean, tanned and greasily handsome, his coal-black hair glistening with an oil 1950’s sheen-was asked for the secret of his longevity on the pop music scene. “I take Vitamin E,” he said, smiling. But whatever the secret of his appeal through two rock ‘n’ roll generations, some things don’t change. Watch Elvis Presley perform “An American Trilogy,” Greensboro, NC, April 14, 1972. “Elvis wore the Owl Fireworks suit,” one observer noted.